Free Shipping Included! Activity Fitness Tracker + Mobile Alerts + Storage Smart Jewelry Bracelet for Women, Dark Brown Leather by Ela Fine Tech at Kode Fu Guru. MPN: ZRB036611YDB155. Hurry! Limited time offer. Offer valid only while supplies last. We're bringing back elegance and manners, allowing you to connect with your tech in a way that doesn't interrupt your face-to- face interactions. We're bringing back elegance and manners, allowing you to connect with your tech in a way that doesn't interrupt your face-to- face interactions. Connect to what matters with beauty and style. With stylish fine smart bracelet pieces that beautifully house your tech, you have a discreet way to carry the technology that connects you to what's important throughout your day. It's not just jewelry, and it's not just technology. It's a beautiful way to manage your modern life, track your steps, activity and fitness and receive custom mobile alerts on your terms and in your own style. You decide how to inter-act with your tech-and you decide when it's time to look up and give your world your full attention. From mobile alerts on your smart bracelet notifying you when an important call is coming through to an easy way to access your favorite memories, tracking your activity and steps throughout the day, with Ela you have easy access to the things that are most meaningful to you. Ela is a beautiful symbol of all you hold dear and allows you communicate with friends and loved ones with just a tap or a touch. And it's the peace of mind that what you care about is always close to you, so you can fully enjoy every moment of your life- while you're in the moment. Activity + Fitness Tracker Smart Bracelet : Live updated step tracking. Health data integrations with Apple HealthKit and Google Health. Mobile Alerts : Prioritize alerts from your most important contacts. 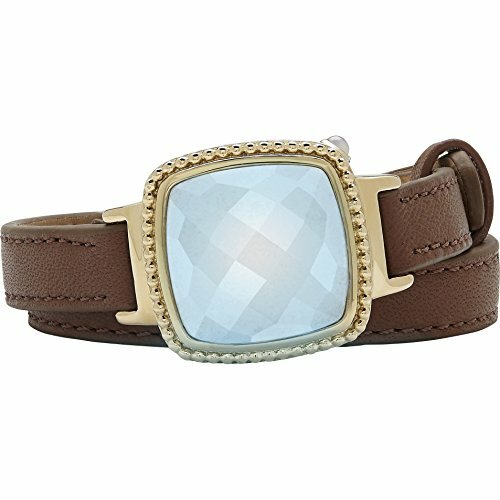 Customize each alert with a soft color glow and gentle vibration on your Ela Fine Tech Smart bracelet. Add up to 8 custom alerts from anyone in your address book and add up to 15 contacts to receive notifications of calls and text messages from. Ela connects to your phone using Bluetooth Technology and is expected to stay connected while you're in the same room as your phone, up to 25 feet. Memory Storage : Create and share special photos and other memories. Access your shared memories anytime through the app. You can create as many memories as you like with a current maximum cloud storage limit of 100mb. Give Ela as a gift to a loved one and pre-load special memories. Material : Your Smart Bracelet is made from Stainless Steel and is plated with 14ct Gold. The center stone is made of Italian marble quartz paired with LED technology for a subtle soft illumination effect. The strap is Dark Brown in color and is made out of fine quality real leather. App Enabled Smart Jewelry: Available for iOS and Android. Ela Jewelry is a division of the Richline Group, Inc., a wholly owned subsidiary of Berkshire Hathaway, Inc. If you have any questions about this product by Ela Fine Tech, contact us by completing and submitting the form below. If you are looking for a specif part number, please include it with your message.